I am so excited about today’s tutorial! I have had this idea swirling around in my little brain for the last several years and I finally decided to stop thinking about it and just make it. I present to you…. 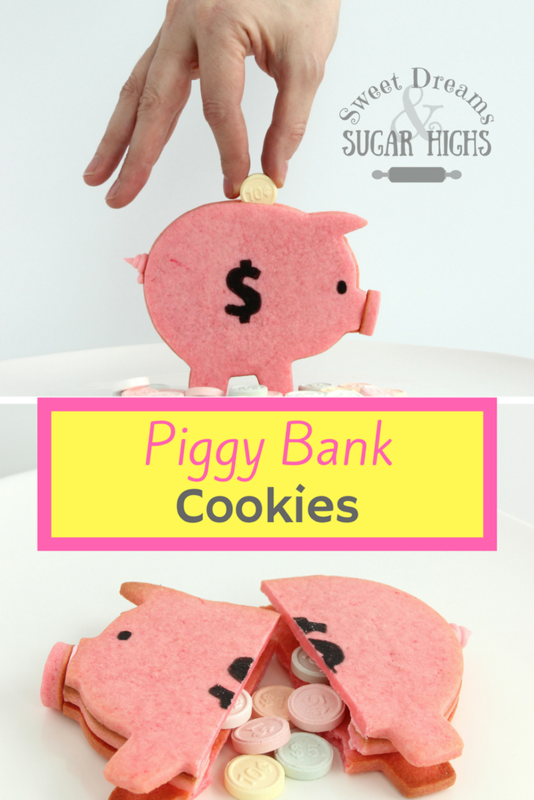 Piggy Bank Cookies! Look at how adorable these little guys are. I just can’t get over this little piggy nose! 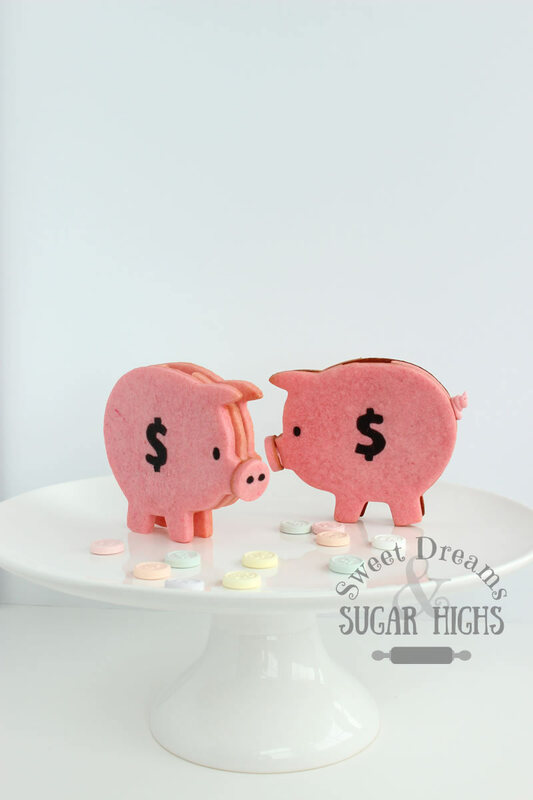 And these are more than just pig cookies, they actually have a slot on the top of them so that you can put money in them. See how they fit so perfectly into the piggy bank? 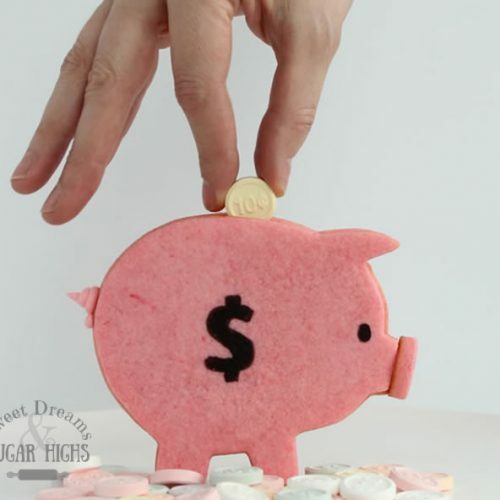 Wouldn’t this be a great way to teach children how to count coins or maybe an incentive for potty training? Or you might be like me and not have kids at home but you just want to make it for yourself because it is so darn cute and makes you smile. And just like a real piggy bank, once it is full, you can break it open and get all your money out. I know you are dying to find out how to make these now so I will get on with it. Start with a sugar cookie dough that doesn’t spread. This is really important because you want your pieces to all line up well together. My favorite non-spreading sugar cookie recipe is Autumn Carpenter’s Buttery Sugar Cookie recipe. If you don’t know who Autumn Carpenter is you need to find out now! If you love cookies at all I promise you will love her. She makes the most adorable and creative cookies. All of her books are wonderful and she also has a great Craftsy class. I highly recommend them all. I’ve included my adaptation of that recipe on the recipe card below but feel free to use your own recipe if you have another your prefer. One thing to remember about this recipe is that it has to rest in the refrigerator for several hours. I prefer to make it the night before I am going to use it then remove it from the refrigerator on baking day and let it warm up for about an hour before rolling it out. The first half of the batch of dough you want to roll out to 1/8″ thick. This is for the front and the back of the pigs and you want it a little thinner than the middle so that your pig doesn’t get too thick. The easiest way to get the correct thickness when rolling dough is to use perfection strips or rolling pin rings. These are my perfection strips. They are wooden slats that come in varying depths. The white ones are 1/8″ thick. 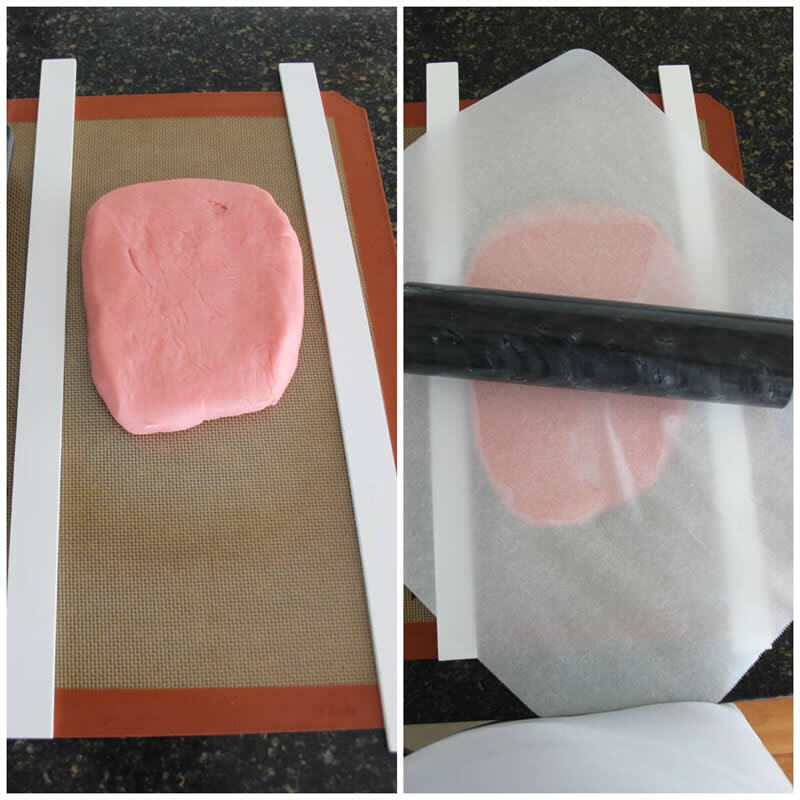 I lay my dough on my Silpat Mat (you can use parchment paper as well), then place the perfection strips around the dough and a piece of parchment paper over the top of it all. I use my hip to hold the parchment in place against the counter (you can see the white from my shirt pressed against the parchment in the photo below.) I then roll the dough until my rolling pin rests on the strips. The nice thing about this is that I usually don’t have to use any extra flour and my cookies are in place on my mat so I don’t have to move them around. 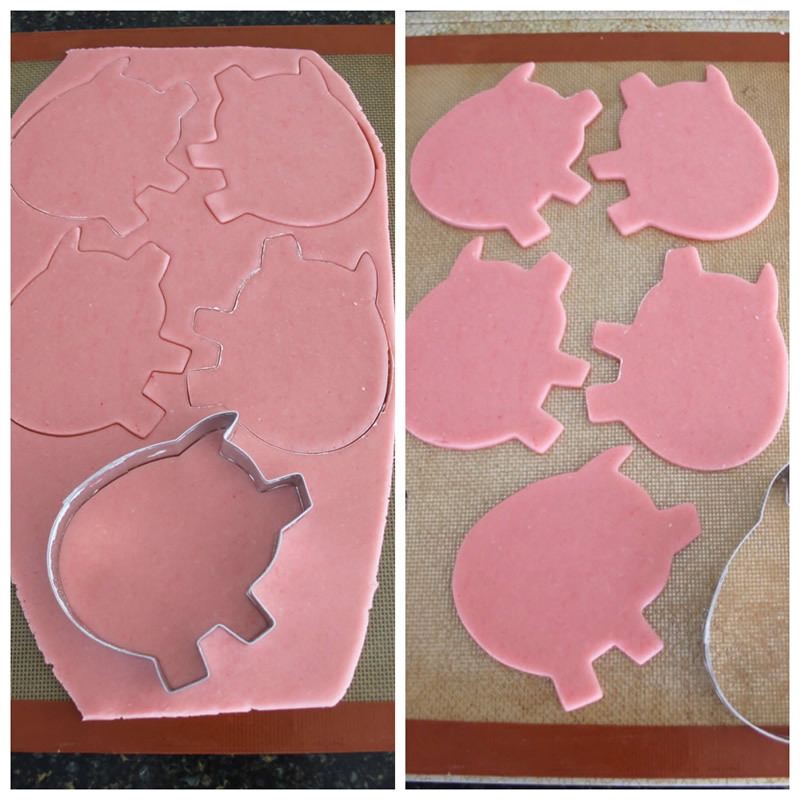 Once the dough is rolled out you cut out the piggy fronts and backs. 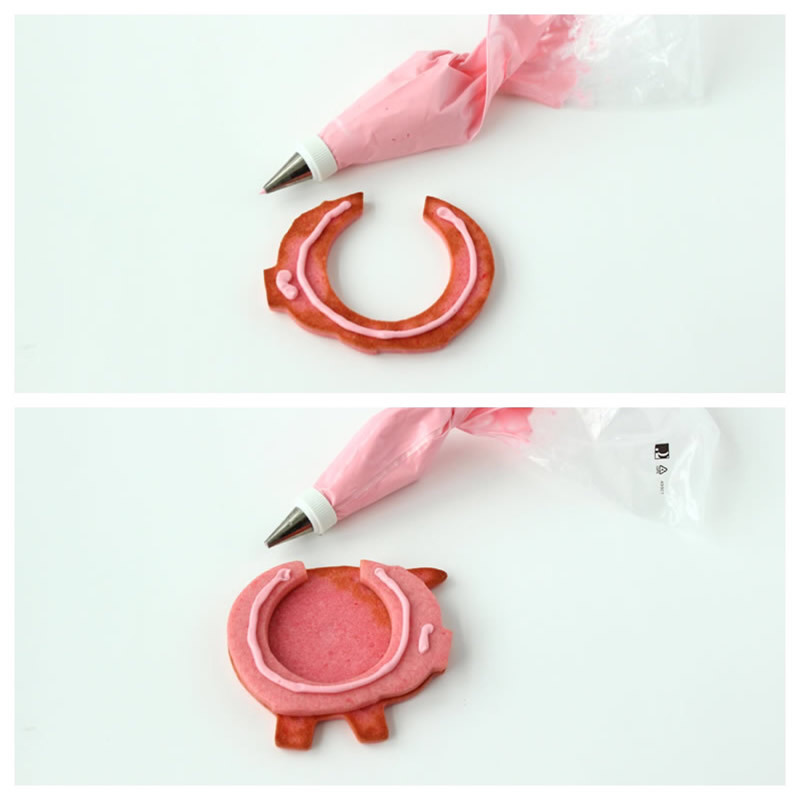 I made my own cutter since I didn’t want to buy a new cutter but I have seen lots of cute pig cutters online for purchase. My cutter is 4″x 5″. 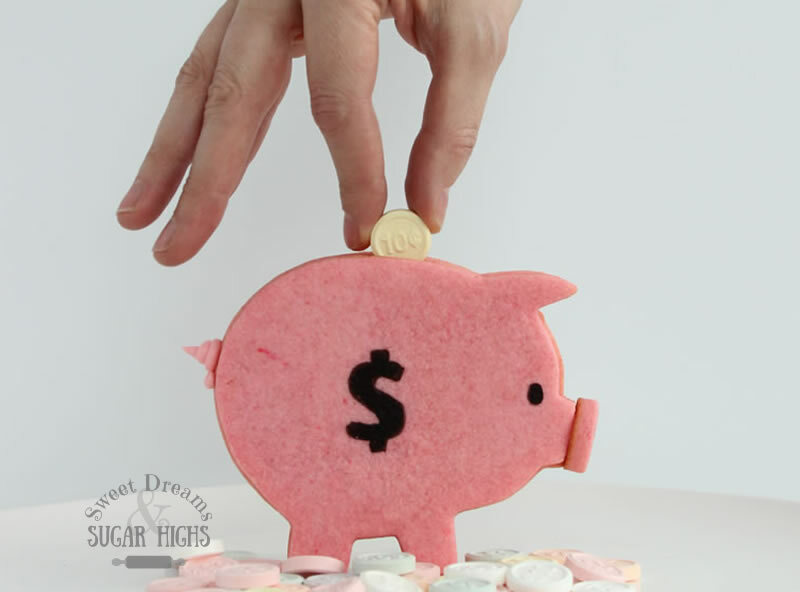 With this size cutter you can get 6 completed pigs out of one batch of dough. So you will need to cut out 12 total pigs, 6 facing to the right and 6 facing to the left. 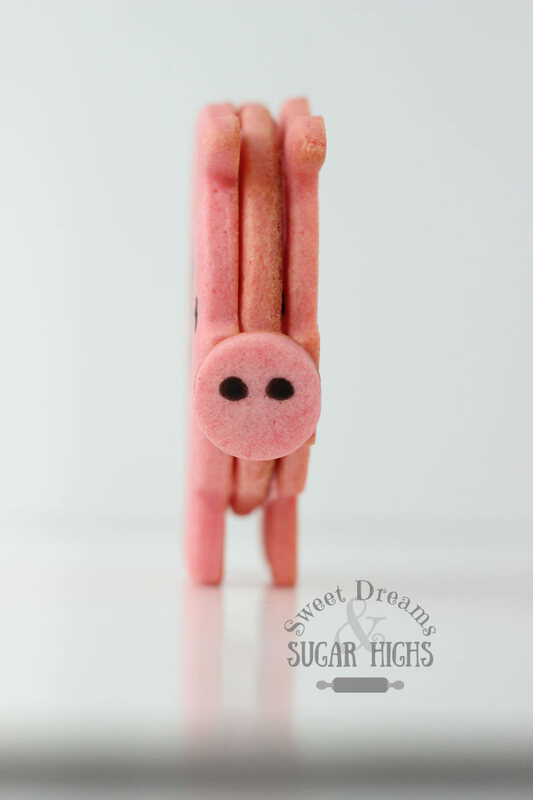 If your pig has a long snout, like mine did, you will want to trim the noses down so that you can later add the cookie noses. I always refrigerate my dough on the baking sheet for about 15 minutes before baking it as an extra prevention to keep the dough from spreading. The cookies should be baked for about 9-11 minutes. Keep an eye on them and remove them just as the sides start to lightly brown. I accidentally let a few of mine go a little too long. After you bake all the bodies you will make the middles and the noses. You need thicker dough for these so you want to roll it out to 1/4″ thick. In my set of perfection strips the red slats are the 1/4″ ones. Cut out 6 middles, it doesn’t really matter which direction you cut them since they will be sandwiched in between the outer bodies. You need to trim off the legs and ears from these cutouts then use a circle cutter (I used a 2 1/2″ one) to cut out the center of the middles. Again, refrigerate the cutouts and bake. As soon as you remove the middles from the oven, take a knife and cut out a notch out of the top, about 1 inch long. 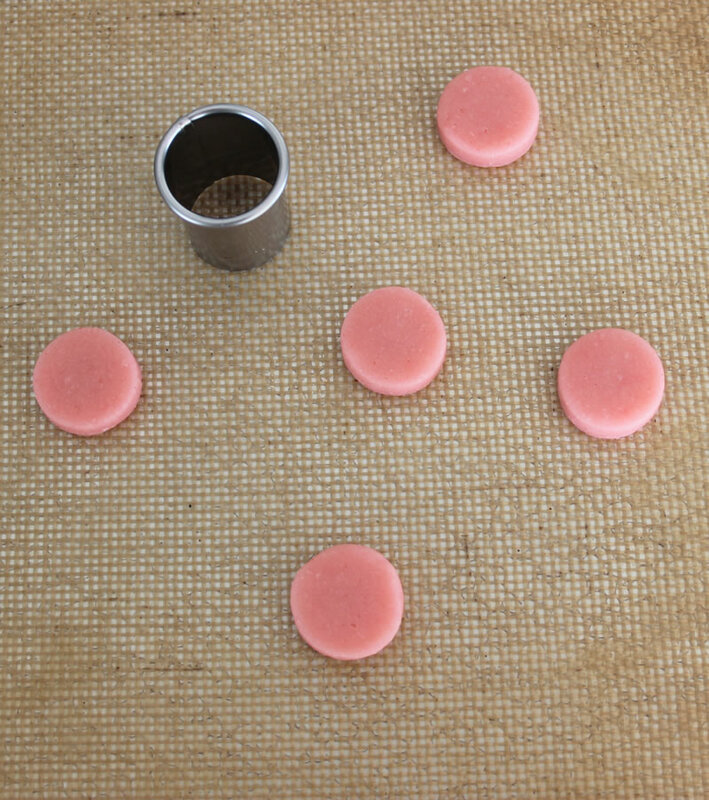 Set a candy coin next to it to make sure it is long enough for the candy to fit through. 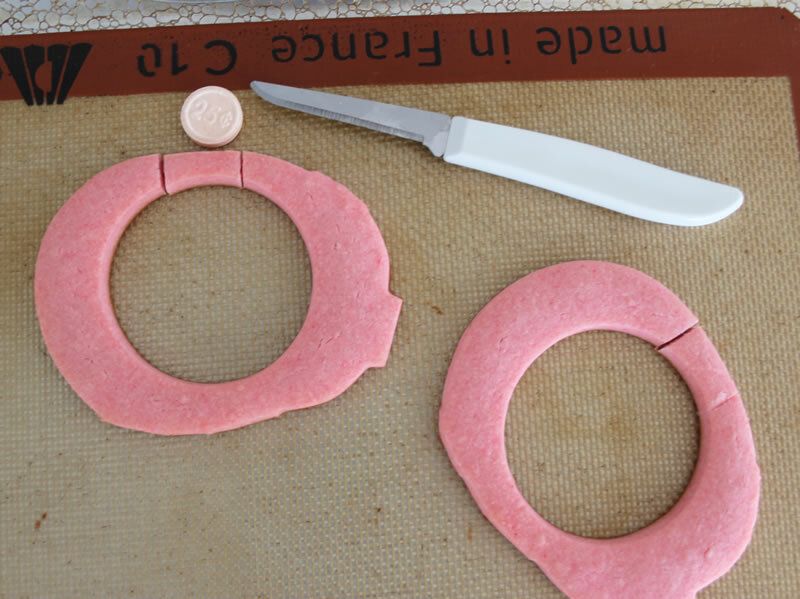 You want to make these cuts while the cookie is still hot because it is more likely to break the cookie if you cut it once it cools. The reason I do this now, instead of before baking, is that it helps the cookie maintain its shape if it is solid while it bakes. 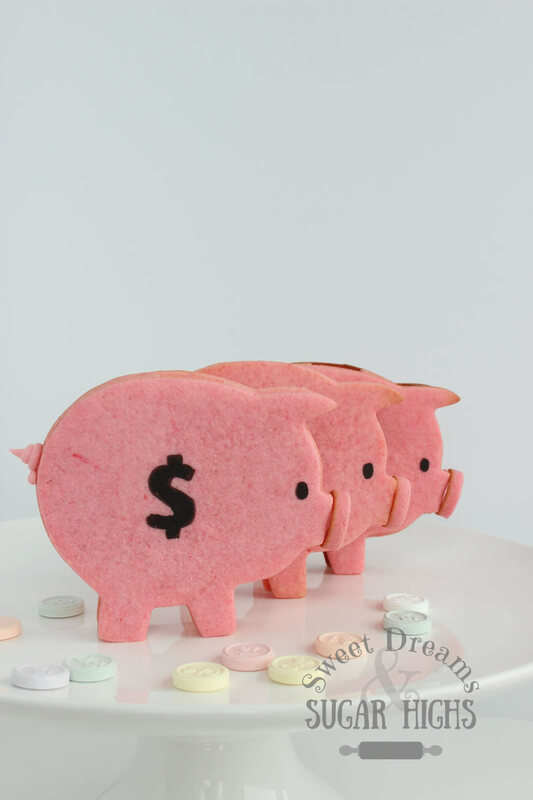 With your leftover 1/4″ thick dough, cut out 6 pig noses. I found that my smallest circle cutter, which is just under 1″, was the perfect size. It is best to bake the noses by themselves since they are small and will likely take less time than the bodies or middles. Start checking on them around 7 minutes into the baking time. 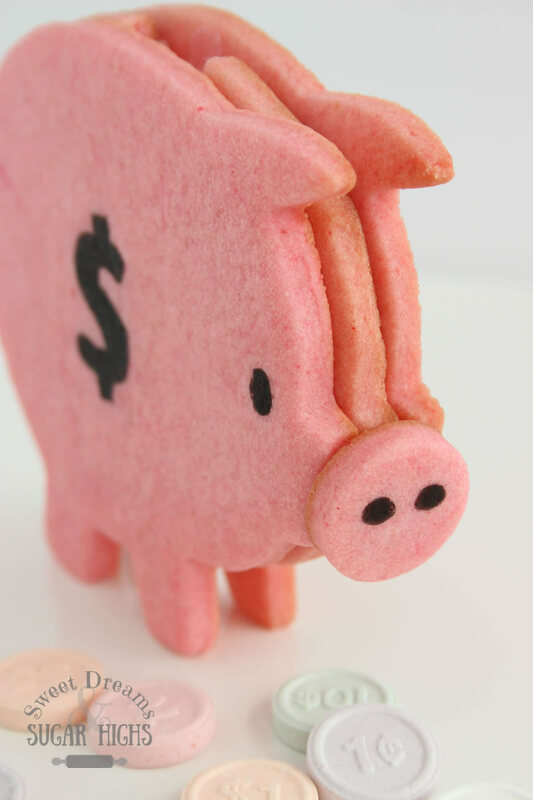 Once everything is cooled completely, use a Food Writer Marker to draw eyes, nostrils and money symbols on the pigs. 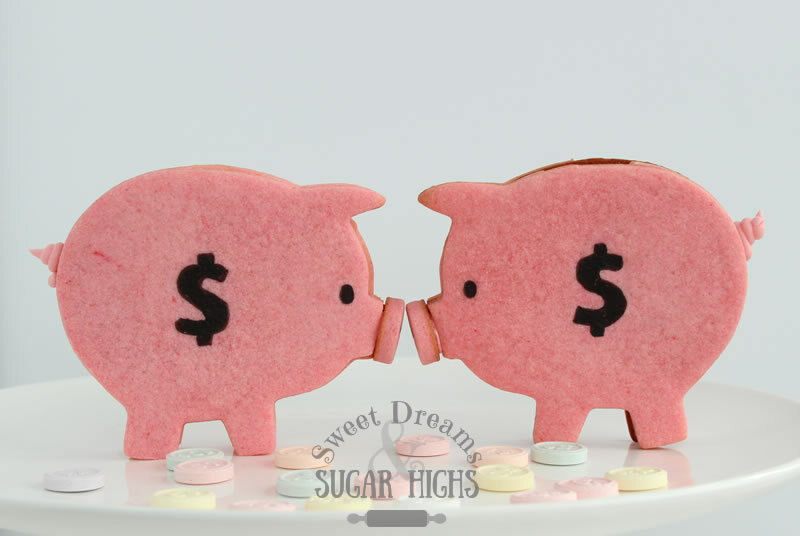 I only put the money symbol on one side of each of my pigs but you can do both sides if you wish. 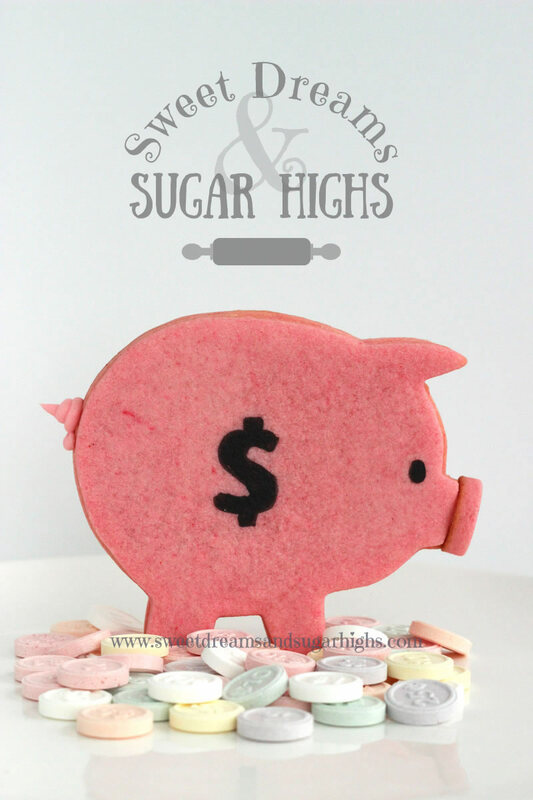 Next make some royal icing and color it the same pink that you colored your dough. I’ve included a royal icing recipe in the recipe card below but, again, you can use any royal icing recipe you prefer. Allow the icing to dry on the pig then pipe some more icing on the back of the nose and attach the nose to the front of the pig. Once the nose is dried and firmly in place, pipe a corkscrew tail on to the pigs bottom. I found that placing the pig upside down between two small glasses made it easier to do. Finally, if you are having any problems with the pig standing because the feet aren’t entirely level, take a microplane and file the feet until they are flat. Now enjoy your little piggies! 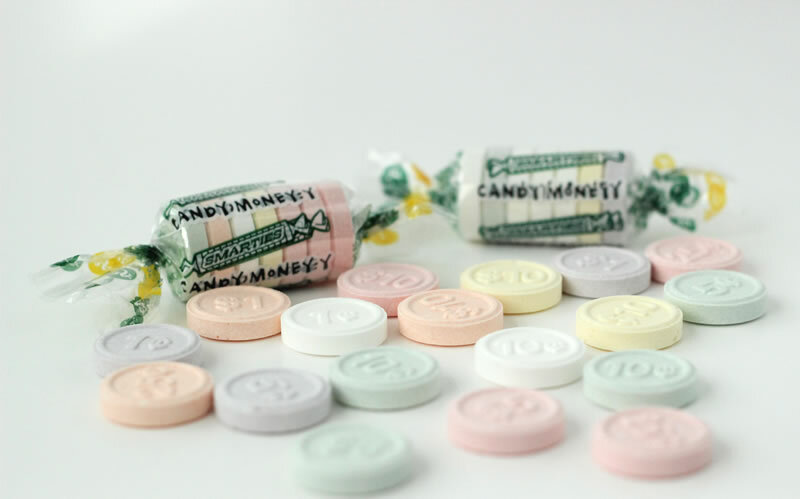 Here’s to Candy Money, Sweet Dreams and Sugar Highs! 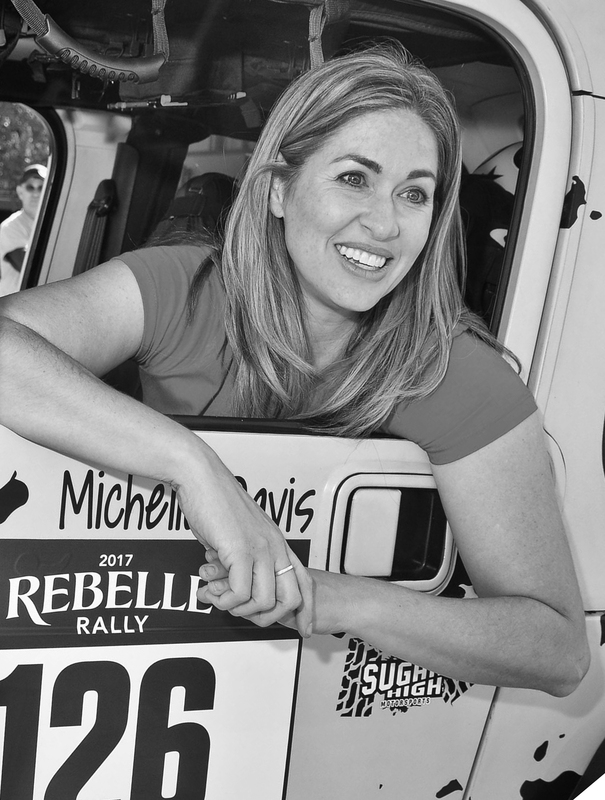 The sugar cookie recipe is adapted from Autumn Carpenter's Buttery Sugar Cookies recipe. I like to make the dough, refrigerate it overnight, then bake the cookies the next day. Mix the butter and cream cheese in the bowl of an electric mixer on medium speed until well combined, about 2-3 minutes. Scrape the bowl. Add the sugar. Continue to mix on medium speed until light and fluffy. Mix in the extract and food coloring. Add the egg, mixing on low, until thoroughly blended. Scrape the bowl. Add the flour, one cup at a time. Scrape the bowl after each addition. Mix until just incorporated. Remove dough from bowl. If necessary, knead in any flour that did not get fully incorporated. The dough will be very sticky at this point. Preheat oven to 375°. Roll first batch of dough 1/8" thick. Cut out 12 pigs, 6 facing left and 6 facing right. Trim down noses if necessary. Place baking sheet, with pigs on it, in the refrigerator for 15 minutes. Remove and place directly in oven and bake for 9-11 minutes, until edges are very lightly browned. Allow to cool completely. Roll next batch of dough 1/4" thick. Cut out 6 pigs (it doesn't matter which direction this time). 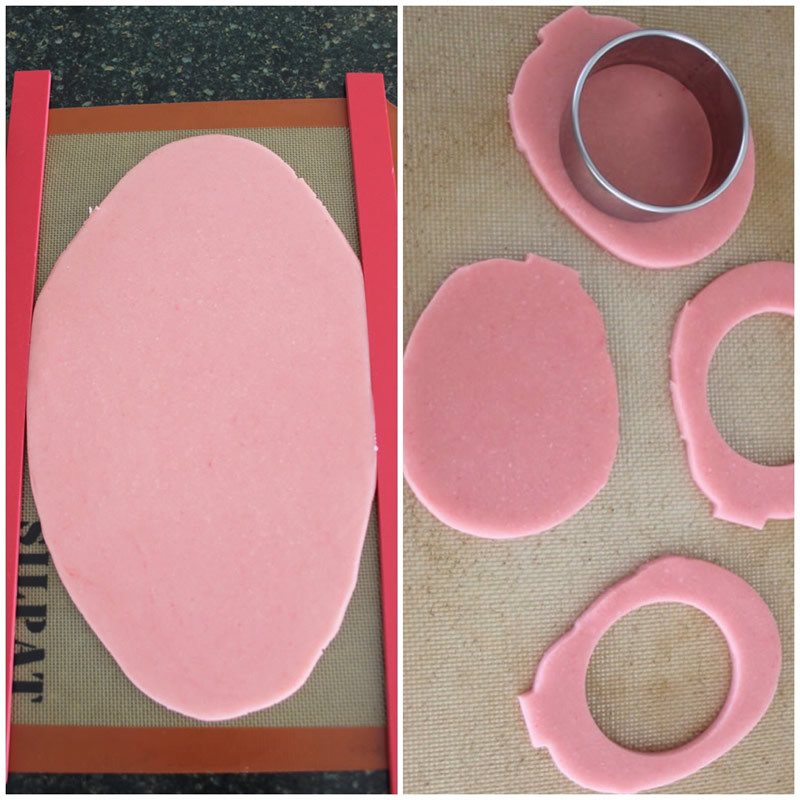 Remove legs and ears from pigs then use a circle cutter to remove center of pig. Refrigerate and bake as before. 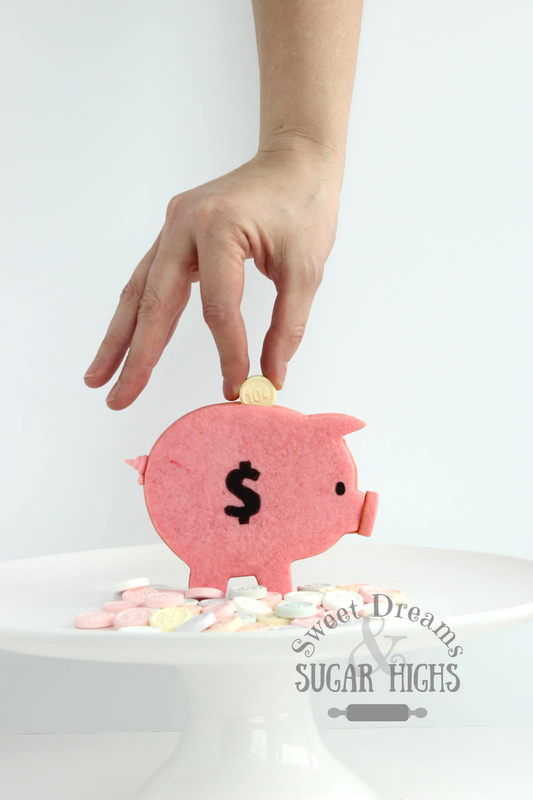 As soon as they come out of the oven, cut out a section of the top large enough for a candy coin to fit through. Allow to cool completely. 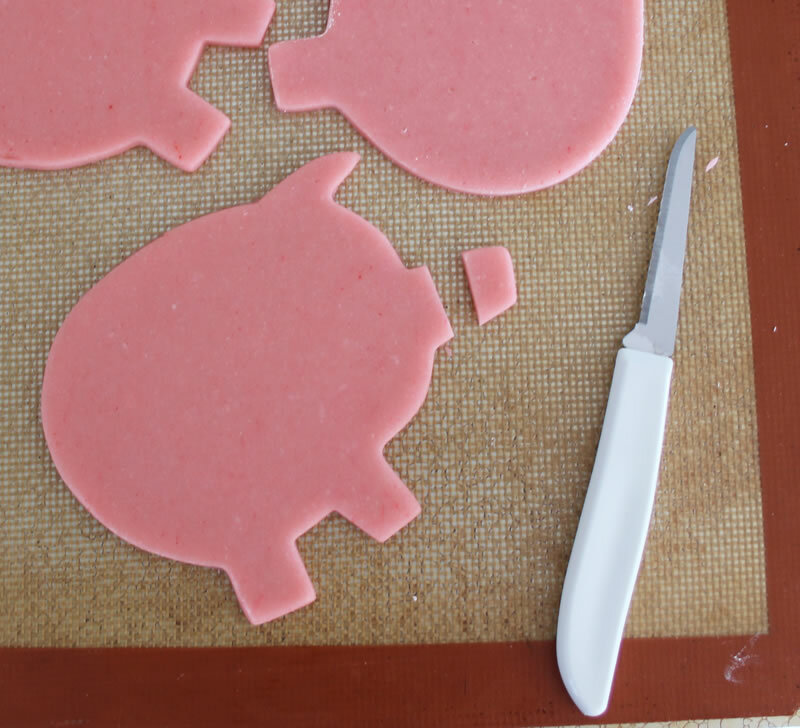 Cut out 6 pig noses, with a small round cutter, 1/4" thick. 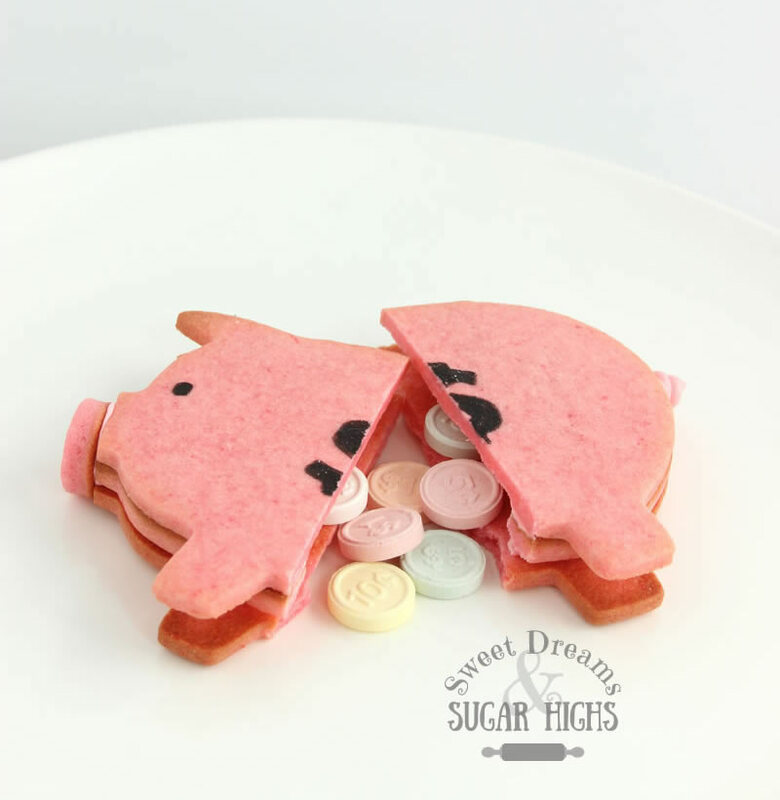 Bake these together, separate from the pig bodies as they will bake quicker. Start checking on them around 7 minutes. When done, remove from oven and allow to cool completely. In the bowl of a mixer, fitted with a paddle attachment, stir the powdered sugar and meringue powder together. With mixer on low, slowly add extract and water. Start with 1/4 cup water and then add only as much that is needed to get the icing to a thick, honey like consistency. 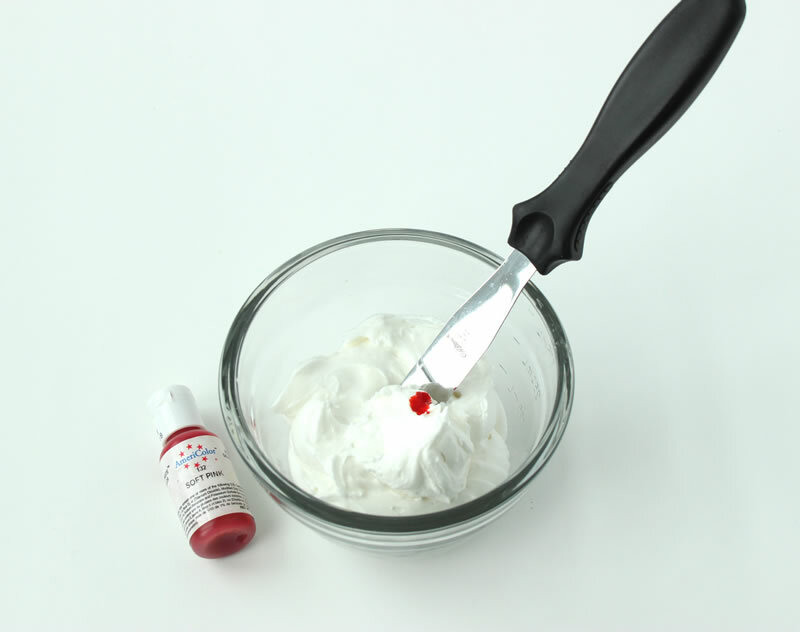 Increase mixer speed to medium and whip icing for 2-4 minutes, until thick and fluffy and forms soft peaks. If too thick, add a small amount of water; if too thin, add more powdered sugar. Keep covered with a damp cloth as royal icing dries quickly. 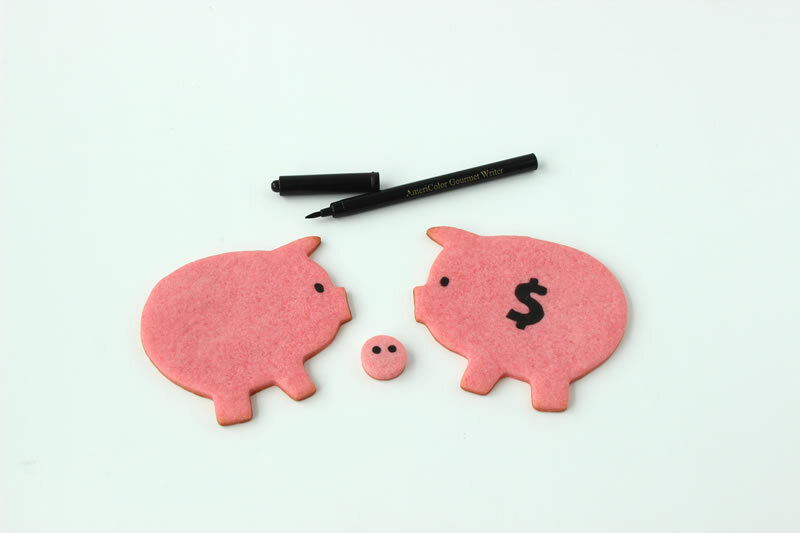 Use a food writer pen to draw eyes and money signs on pigs and nostrils on noses. 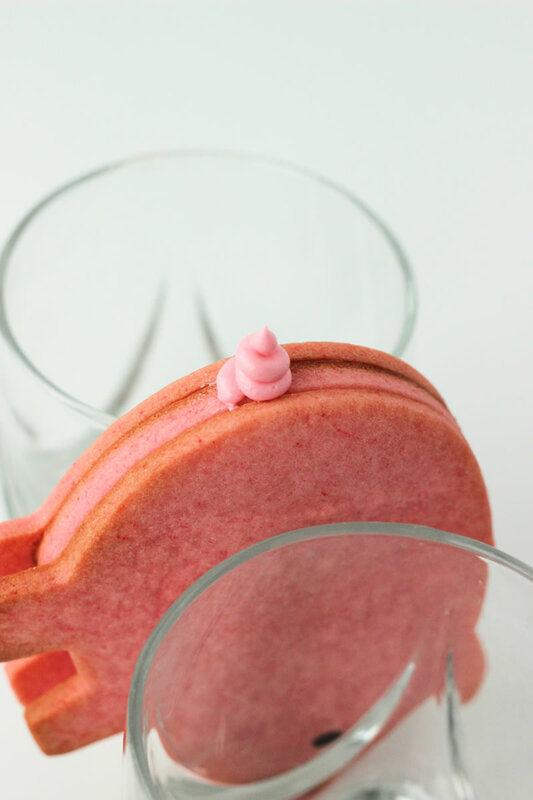 Use food coloring to color icing pink. 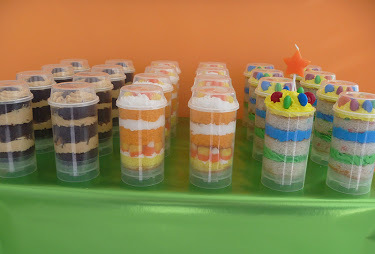 Place icing in a decorating bag fitted with a #6 round tip (or in a plastic sandwich bag with the corner sniped off.) Pipe icing around bottom of one inner pig body and attach to one outer body. Pipe more icing on to the top of the inner body and attach the opposite facing outer body. 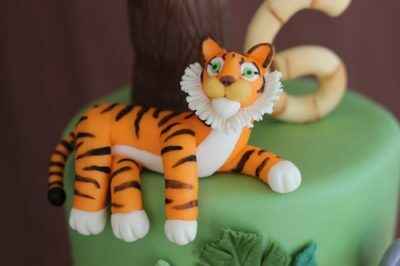 Once dry, attach the nose with icing. Once nose is dry, support pig between two glasses and pipe a tail. 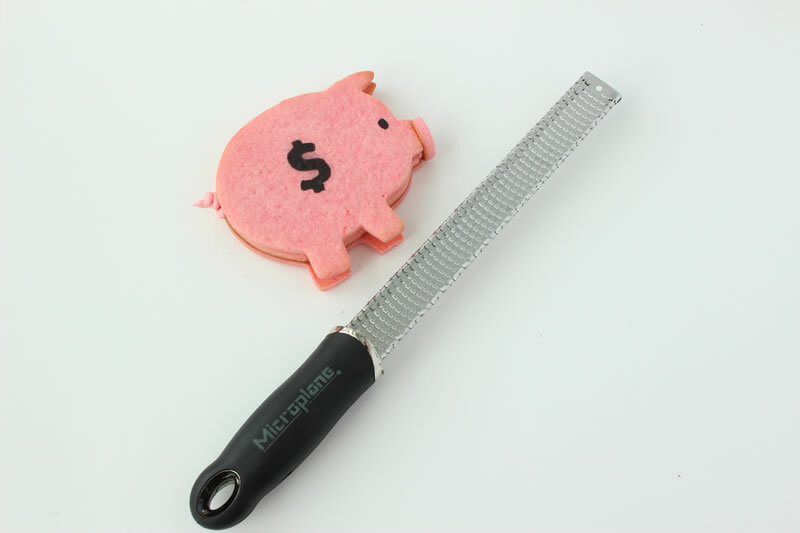 If necessary, use a microplane to file down the feet so that the pig stands firmly. 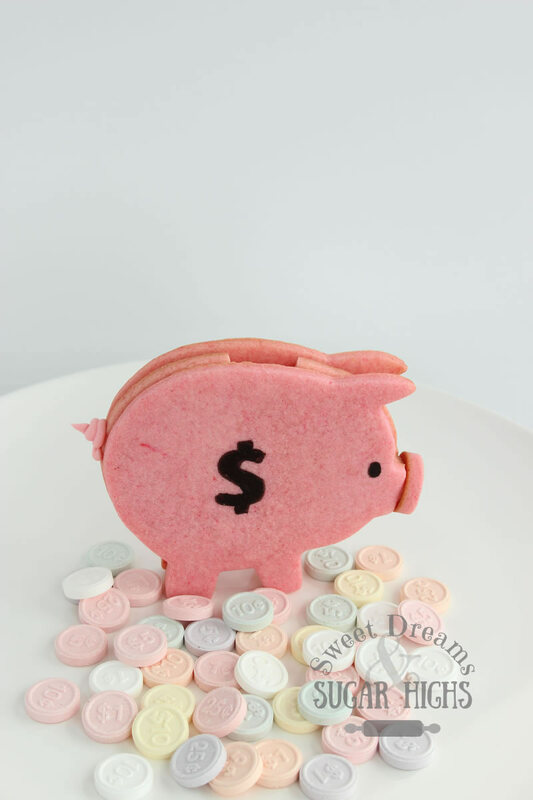 Have fun dropping candy money into your piggy bank. *You could also use chocolate gold coins but you would probably have to just use the smaller sizes of them. 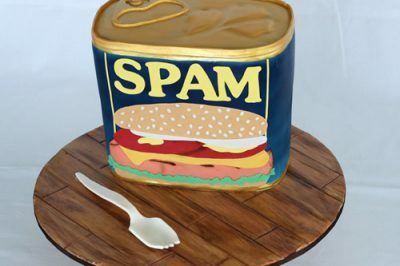 Aaaaaaaagggggggggghhhhhhhhhh I can hardly wait to try this! It’s so cute! Love it, and your directions are so clear. Thank you for such a great idea! Thanks Betsy! Hope you have as much fun with them as I did.